[One] who keeps company with glaciers comes to feel tolerably insignificant by and by. Glaciers are perennial ice masses that are large enough to experience gravitational deformation: the flow of ice under its own weight. Glaciers and ice sheets nucleate where snow accumulation exceeds snow ablation over a period of many years or decades. With time, the accumulated snow is buried, compressed, and transformed to glacier ice. 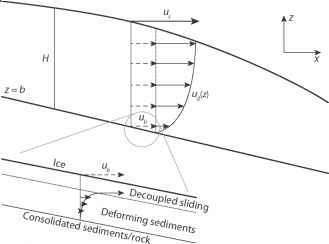 Ice behaves as a nonlinear, vis-coplastic fluid; once ice thickness is sufficient, internal gravitational stresses cause the ice to deform. Mountain glaciers are found throughout the world's alpine regions, including the high mountains of tropical East Africa, South America, and Guinea. There are many types of mountain glacier, classified primarily from the topographic setting, but prominent among these are cirque and valley glaciers. These can be independent ice masses, self-sufficient in an alpine niche, or valley glaciers can also be outlet glaciers that drain icefields or neves: low-sloping snow accumulation areas that mantle mountain peaks or high-elevation plateaus. Icefields conform to the topography, with high peaks looming above the ice surface on the icefield perimeter and within the ice mass itself. Peaks or ridges that poke out of the ice are known as nunataks. The structure of the mountains and the valleys that separate them dictate ice flow directions and the shape and extent of an icefield. This distinguishes icefields from ice caps, which overwhelm the underlying topography, with ice flow determined by the geometry of the ice cap itself. Figure 6.1 provides examples. thousands of years old, and they reside in polar environments with extreme cold; large regions of each ice sheet are too cold to experience surface melting. They are also large enough to influence atmospheric circulation, planetary albedo, global sea level, and many aspects of regional climate (chapter 8). These are the only ice sheets in today's world, but the Pleistocene ice sheets in North America, Eurasia, Iceland, and Patagonia, which waxed and waned with the glacial-interglacial cycles, had similar features and effects on the climate. There are various flow features within ice sheets. Ice streams and ice shelves are the most important large-scale features for ice sheet dynamics. Ice streams are fast-flowing regions of the ice, where ice velocities can be orders of magnitude higher than those in adjacent ice (e.g., thousands of meters per year versus tens of meters per year). Ice streams are normally laterally constrained—channelized in a sense—although they are not always constrained by bedrock topography. Ice stream width in parts of Greenland and Antarctica is enigmatic and varying, related to bed conditions. Warm, wet-based sections of the ice sheet support fast flow, in contrast with ice that is frozen to the bed. We return to this later in discussion of glacier dynamics. In this type of ice stream, the lateral margins are known as shear zones: narrow features characterized by heavily fractured ice. Ice shelves are marginal areas of the ice sheet that are free-floating in the ocean, composed of glacier ice that has flowed out onto the sea (rather than sea ice, which is frozen in situ). Ice shelves rim much of Antarctica, where they are hundreds of meters thick. The large ice shelves are fed by numerous outlet glaciers or ice streams. 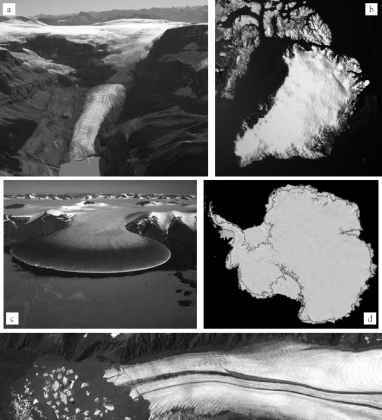 There are also ice shelves in the Arctic, on Ellesmere Island and Greenland, although these are much smaller and in many cases are considered to be floating ice tongues: marine-based extensions of individual outlet glaciers.